Going back to school day after day, the kids may feel like they are carrying the world on their shoulders. And oftentimes, they actually do because mostly they carry a school backpack that is more than 10 percent of their body weight. Teachers expect them to carry all the binders and textbooks and other school supplies they needed in school and you as a mother make sure that your kids have a pile of lunch and snacks, clothes for P.E. class and other schools activities like sports - which typically weigh a little over 6 kilograms or more ...are conceivably dangerous. 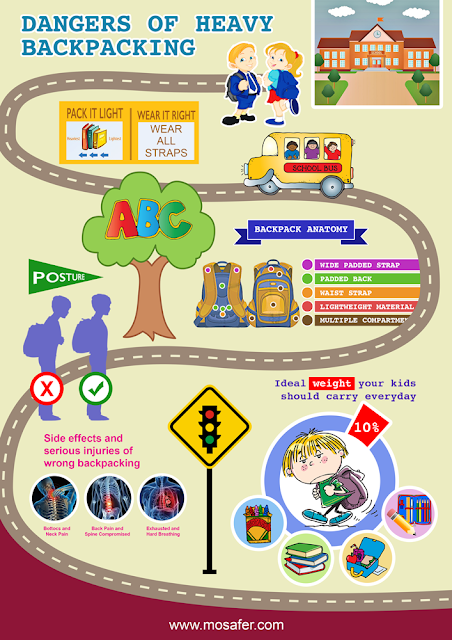 A backpack can cause a lot of problems to kids, like developing a physical stress, spinal health problem, posture might go awry, and other related back pain problems. As stated by the U.S. Consumer Product Safety Commission (www.cpsc.gov), 14,000 youngsters are treated yearly for backpack-related injuries. Imagine if your child is only 29 kg and he/she has to carry the third of their body weight every day throughout the school year. The American Academy of Orthopedic Surgeons (http://orthoinfo.aaos.org/topic.cfm?topic=a00043) recommends to lighten a load of your children backpacks to prevent back pain, neck, and shoulder pain and posture problems. Additionally, OrthoInfo (http://orthoinfo.aaos.org/topic.cfm?topic=a00043) set some guidelines to follow that can help a family for child safety. :An ergonomic design - that will treat your body right and provide several health benefits like preventing unnecessary strain on the neck and back muscles which might lead to injury. Why? Because, ergonomic back packs divided the weight you are carrying smoothly on your body by allowing the most powerful muscles across the back to bear the weight, it mainly focus on confining the weight put in a traditional backpack. :Padded backpack and wide shoulder straps - gives the wearer some added comfort and offer the long-term support. :Lightweight - consider the material - canvas or nylon weigh less, the fit for your child, the design, the frame and the weight of the backpack. :Waist Belt and Chest Belt - Important feature because it takes some weight off the shoulder and back and distributes it to the waist. :Multiple compartments - Keep the books and other school supplies organized and it help distribute the weight evenly. :Child's comfort - Choose a backpack that is not bigger than your child and makes sure the child is comfortable wearing it.